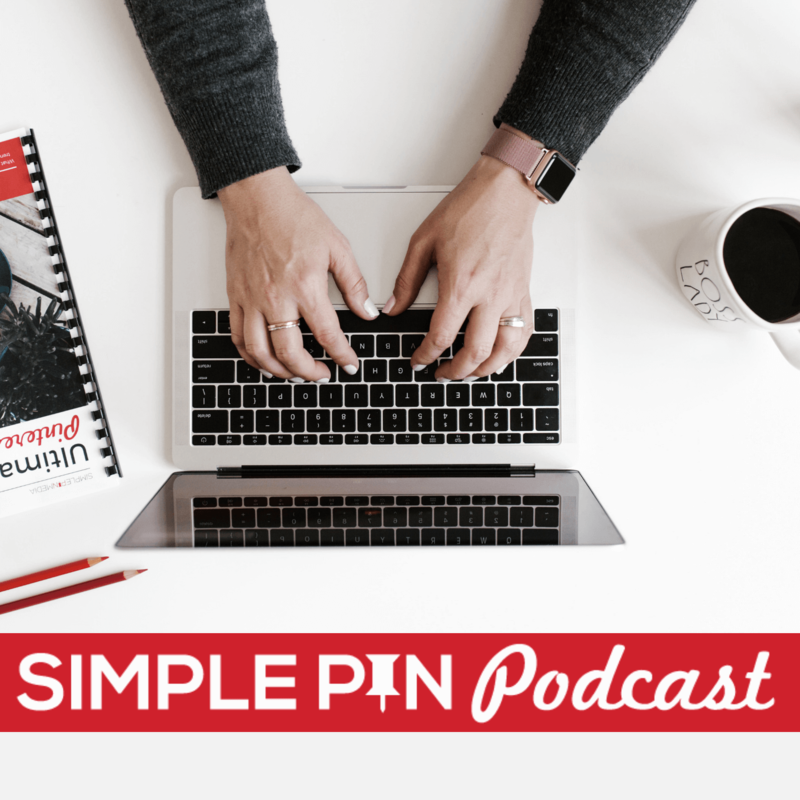 This week marks the 100th episode of the Simple Pin Media podcast. We will be giving away five $25 Starbucks Gift Cards to our most loyal fans all day today (May 23rd). Be sure to stick around until the end of the post to get the full details of how to enter the giveaway! With that, let’s start the celebration! Two years ago I said “yes” to starting a podcast. The person behind the popular Pinterest-related podcast at the time had just stepped away, so there was an opportunity to fill that void. My coach suggested that I step into that space. Based on my Kolbe scores, I’m not a procrastinator and I don’t do well with getting things done last minute. I like doing things in advance so that I have flexibility and the freedom to be creative. Because of that, when the podcast opportunity presented itself, I knew I couldn’t start without having a good system in place first. The first thing I knew for sure was that I had zero desire to edit my own podcast. Editing is not in my wheelhouse at all. Someone referred me to Darrell at Pro Podcast Solutions. After one call, I realized that it was the perfect company for me. I have since met Darrell in person and I am even more convinced that he was the right choice. He and his team have been invaluable to me. And they get total credit for inserting those drum rolls in today’s episode! My wife will not have a podcast intro that sounds like the Indigo Girls. That’s lame. I was disappointed at first but just realized that it wasn’t my thing and I needed to hand it over to someone else. My husband decided to take on the intro and design it himself. What he came up with is what you hear every time you listen to my podcast. I’m pretty sure it will stay that way for as long as I’m a podcaster. I know so many of you have told me that it makes you laugh every time. With the editing and intro crossed off the task list, I had to decide next whether I wanted show notes or a blog post to go along with each episode. Show notes always felt clumsy and hard to read to me, so I decided that we’d publish a companion blog post each week. That would serve both our listeners (as a reference), and also those who prefer reading instead of listening to podcasts. Taking a podcast episode and turning it into a blog post can be a super time-consuming task, so I knew I had to hire someone for this task. This is where Dawn Mole came in. My coach at the time, Leslie Samuel, had pre-interviewed Dawn and recommended her highly. She’s been my podcast writer since my very first episode (and I hope she never leaves). She does a great job of just capturing my voice and always produces quality work. Having Darrell and Dawn there from the very beginning has been instrumental in achieving the 100 episode milestone. Working with this team, I’ve been able to create podcasts consistently, despite many challenges. The biggest bump in the road I ever experienced during this podcasting journey actually occurred right out of the starting gate, when I had to record the first three episodes. It seems like everyone who creates a podcast has a really awesome launch plan. I did not! The first three episodes were recorded back-to-back while I was recovering from the flu. And I’m not talking about a small cold here, it was the legitimate flu (seven days of fever, an ear infection, and so much pain). We were also fostering an 8-month-old at the time (who also had the flu). It was a crazy time! But I really didn’t want to keep pushing podcast recording to the back burner. I went to a friends house to record the episodes. I didn’t want my baby in the background, and my She Shed was still in the process of being built. A funny thing happened. Once I jumped in and recorded those first few episodes, I knew that podcasting was going to be my favorite way of communicating with my audience. I loved interviewing guests. I loved the ability to be passionate via my voice (which you just can’t achieve through written words). and I loved diving deep into a topic without having this strong need to edit myself. But the best part of producing the Simple Pin podcast is meeting those of you who listen to the podcast. I love it when you tell me that you listen in every week and feel as if we’re friends. So thank you, thank you, THANK YOU for listening and being invested in what I have to say. In the last two years, the podcast has been downloaded over 300,000 times and that number grows each and every week. I’m counting down the most popular episodes from the last 100 (based on the number of downloads) and share a few of my favorite tidbits from each one. This was the third episode I recorded when I still had that flu. Bless Kim Herrington for dealing with my fuzzy brain. She walked us through SEO and Pinterest and how to properly keyword on Pinterest. She taught us how to figure out your searcher’s intent and get your content in front of them. We followed up with another episode about keywording that is also on the top 10 list. Something I learned from this early episode is that you have to work on staying engaged and making sure that everything will make sense to the listener. During the production of this episode, I realized that there was an art to podcasting and I needed to work on honing my craft. Kristie Hill is a familiar name to those of you who have been listening to the podcast for a while. We share a love for providing quality information. In this episode, we dive deep into how to use analytics for Pinterest (not just Pinterest analytics, but Google analytics as well). In this episode, we really wanted to hammer home that impressions are not a sign of growth and that there are tons of Pinterest graphics that clickbait you with the growth of impressions. That’s not an indicator of traffic. We may have gotten a little soap-boxy here. We talk about the top five reasons to check your analytics. Those reasons are content, strategies, pins, growth, and trends. Be sure to listen to this one to get the details. Ah, the newbies! We needed a podcast that helped those who came to us and said, “I don’t get Pinterest. Where do I start? !” We started with a basic understanding of how Pinterest works. We reviewed the account set up process, creating the right Pinterest boards, and the basics of creating great images. In this episode, we avoided going deep into day-to-day strategy, so as not to overwhelm anyone who was brand new to Pinterest. For this podcast, we knew we needed someone who had extensive experience with both Pinterest AND selling. To find our guest Liz, my operations manager Natalie searched high and low on Pinterest. Not only does Liz have 3.7 million followers on Pinterest, she also has experience selling products on all types of e-commerce platforms. She sells on Etsy, a website built on the Squarespace platform, had plans to migrate to a the Shopify platform at the time we recorded the episode. pins that have an “X factor” – these pins are unique to your business and/or the client you’re trying to attract (for example, featuring a “Don’t Let the Muggles Get You Down” mug to attract Harry Potter fans). This was my first 3-person interview, and such a fun episode to record. Chrissa from Physical Kitchness had been working with Kristie Hill to start her blog. Pinterest played an instrumental role in her growth. We broke it down — covering first timer fears, overwhelm with scheduling, milestones that occurred at the 3-6 month mark, and then again at the 18-month mark. After that episode, I decided to follow Chrissa on Instagram. It has been so amazing to see all her growth, even while her husband is deployed for a YEAR! Make sure you listen to the episode and then follow her on Instagram. Images on Pinterest are the gateway to our site. It’s the first chance to hook a Pinterest user in. If you create lackluster images, expect a low click-through rate. I brought in one of our clients that totally rocks images: Cassie from Wholefully. I asked her to break down an easy way to approach images for those, like myself, that are NOT gifted in this department. My favorite takeaway from this episode is that images are like billboard advertising. You only have 3 seconds to capture someone’s attention. You need to be strategic about what you put on that image. Cassie also shared some non-traditional ways to look at content creation, including her tip on including multiple pinnable images in each post. Monica Froese rocked my world with this one and even called me out a little bit. Kristie Hill and I had just recorded that previous podcast (the #9 top episode) Monica disagreed about our point of view regarding Pinterest impressions. In this episode, she taught me that impressions actually could be useful. In this episode, she showed us how we could use impressions to guide us in the process of creating better images. Monica goes into some amazing detail on how to find keywords in the episode. Start listening at 22:00 to revolutionize the way you do keyword research. I even sent this episode to my team so they could benefit from Monica’s teaching on keyword research. This episode covers what you need to be doing daily, weekly, and monthly on Pinterest. Alisa Meredith had created this amazing action plan blog post so I wanted to bring her onto the show to explain in more detail how she came up with the plan. Keywording is the lifeblood of the Pinterest Smart Feed. It’s what makes Pinterest a search and discovery engine instead of social media platform. If you’re not using keywords, the person searching can’t find your content. In this episode, we broke down keywording into an easy to understand action plan so that people could easily build the practice into their workflow. This episode covers the why, where, and how of keywording, so it’s no surprise that it’s one of the top episodes. We even included a special checklist for readers . I just hit publish on my blog post — now what? Since I’m all about mindset, I started the episode reminding everyone that there is no quick fix or magic strategy, so stop looking for tactics and focus on goals. When we recorded this episode, we received a lot of tips from our community about best methods for pinning. In April 2018, Pinterest released their best practice guide and served up the ideal plan on a silver platter. We learned that the first 5 pins you save each day will be prioritized for distribution in your follower feed. We learned that it’s important to pin to the most relevant board first. Now we know to pin FRESH content right away and choose the boards that are most relevant instead of just choosing your blog board first. This episode is my favorite because I really wanted people to think critically about what works best for them as far as workflow and systems for being consistent on Pinterest — which is exactly what Pinterest tells us we should do. The deadline for entering the giveaway is 5/23 at midnight PST. We will select 5 winners at random on 5/24 and will contact you via email to make arrangements to deliver your gift card. There you have it! The top 10 of the last 100 episodes of the Simple Pin Podcast. We would love to hear your feedback and which episode is your favorite. If you’ve listened to every single episode, make sure you let us know! And be sure to enter the giveaway! We can’t wait to hear from you. And THANK YOU for listening while you work out at the gym, at work, while driving, etc. I appreciate your loyalty and look forward to the next 100! I love listening to your monthly pinterest trends! I didn’t know what a podcast was last November, but a girl at work was listening to one and I asked about them. She explained what they were and this one was the first podcast I have ever listened to on my phone and/or subscribed to. I love it. I have learned so much and you make everything sound doable. Thank you so much for taking the leap to do it and helping the rest of us grow our businesses. Episode 64 was my favorite! Every episode is packed with valuable info which makes it so hard to choose just one! Love the show! I’ve kearned so much and am so grateful. Also I love your intro music. Gets me all happy to be listening to my podcasts! Woohoo for 100! I couldn’t choose just one, but I’ve listened to them all every Wednesday morning! Congratulations! I love your podcasts. I go back to certain episodes from time to time and my kids go…oh it’s the Pinterest lady again! Congrats on your podcast centennial! I have a lot of catching up to do now. Your info is always top-notch, and greatly appreciated. I regularly listen to the podcast! Thank you for keeping us up to date on the best strategies for utilizing Pinterest. Congratulations on your 100th episode! Congrats on your milestone! I first heard you on Elite Edupreneurs and then hopped over to your Simple Pin Podcast. The SEO and Pinterest Analytics episodes have been my faves. It’s been a fun ride to 100!! I can’t wait to see where the next 100 takes you and I hope to be there every step of the way. You are the best and I appreciate you so much!! Congrats on you 100th episode! I am a new blogger and love listening to your podcasts. My favorite is episode 72, understanding Pinterest analytics. Thanks for all you do! I’m new to your podcast and loving it! The Myth Busting part 2 episode was so helpful! I think the Mythbuster Podcast was my favorite. It covered all the topics I was curious about. My second favorite was the newbie one – so much stuff I never learned. Congrats on the 100th episode! I love SPP and can’t pick just one favorite episode. I really like all of the ones discussing analytics and also the A/B split testing. Congrats on 100!!! I loved the episode on How to Create a Pinterest Marketing Plan. I need a game plan for everything I do to get me started and then adjust to what works for me. Thanks!